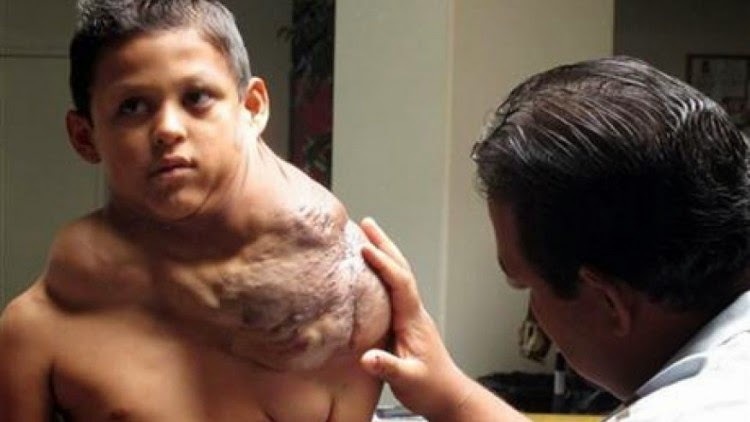 In the video below is featured an 11-year-old Mexican boy who had been suffering from a huge tumor reportedly the size of a football. He must have cried with joy after the growth was removed from his neck, shoulder and torso area via a surgery on Nov. 17, 2014 at the University of New Mexico Children’s Hospital. Although the massive growth was found to be benign, Jose’s parents have disclosed that its size has affected his eyesight, and has limited his movement on the left side. Furthermore, it has reportedly grown into Jose’s trachea which the El Paso Times reports has hampered his breathing. Jose’s parents have also feared the growth might soon move towards his heart. So they felt hopeful when their boy caught the attention of U.S. officials who helped him get treatment in New Mexico; thanks to church members of the First Baptist Church of Rio Rancho who chanced upon Jose during a missionary visit to Ciudad Juarez in the year 2012. Upon learning that Jose’s parents had hit a dead end in getting medical help for their boy, the church members, through Kristean Alcocer, a ministry coordinator for the Church, helped to get Jose to the US via a humanitarian visa. Reports say that the U.S. Homeland Security Investigations have assisted in transporting Jose and his parents from a neighborhood in Ciudad Juarez, Mexico, which is reportedly one of the deadliest cities in the world at the time because of the presence of drug cartels. By July of 2012, efforts were exerted to properly address his massive burden which prompted his travelling back and forth to receive treatment since then. The medical team at the University of New Mexico Hospital have divulged that a series of surgeries and treatments were necessary to remove the huge fluid buildup inside Jose. Finally, “two years in the making,” says Alcocer; in reference to the surgery which took more than 12 hours and involved 25 medical professionals. Alcocer also shared that his medical expenses have been covered as the church has commendably raised funds for the treatment; especially after his story went viral and more help came in. He’ll be in hospital for at least one month, and future surgeries are still to follow which will involve rebuilding of his shoulder bone and removal of excess skin, as per reports by USA Today. As Alcocer puts it, “The road to recovery will be long, and many challenges still lie ahead for this young boy.” But surely, with the first big step taken, Jose and his parents are looking forward to more reasons to be thankful for.